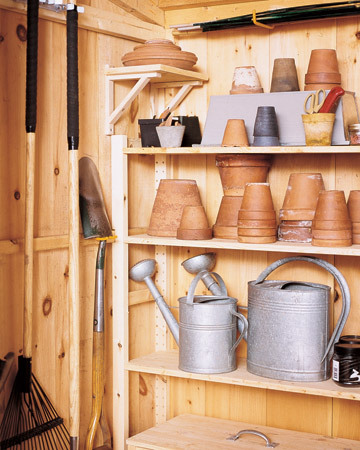 The Shed – Where do you keep your gardening tools? This is one of the biggest steps to becoming organized. If your tools aren't all kept in the same area, take time now to gather them. A good place to keep gardening tools is in a backyard shed. If you already have one, take some time this spring to clean it out and designate shelf space to all of your tools. Wood lattice hung on the back of the shed door makes a great surface for hanging trowels, spades, gloves, and other small gardening items you use often. Label Happy – One thing that will save your life is labels... learn to love them. Labels can be used, and should be used, everywhere. You can use them in the garden itself to label seedlings, you can use them in the shed to label buckets of tools, and you can also use them to label extra bags of seeds. Labeling will help you stay organized and could also help you save money. If you know where everything is, and what everything is, you won’t waste money buying seeds and tools you already have. Game Plan – In order to be an organized gardener, you must not only organize your tools, you must also organize yourself. A growing garden requires tender loving care and plenty of regular maintenance. If you’re a disorganized person, then the best thing you can do for your garden is make a game plan. Sit down and craft a gardening schedule and stick to it! What days can you get out there and pull weeds and on what days will you have to rely on the automatic sprinkler system? If you construct a gardening plan, you’ll be less likely to forget about pruning, watering, weeding, and transplanting.